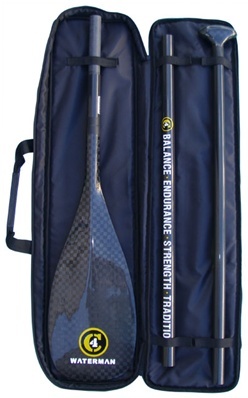 This round C4 3-Piece Carbon Stand Up paddle is extremely versatile, making it easy to take on the next adventure and comes with a durable, light weight travel bag. The blade is eight inches long, has the proven dihedral and is made of 12K weave carbon. This patent pending shape featuring a keel shaped bladeneck (dihedral) on the powerface of the blade. The dihedral flows the water down and off the board, steers the paddle straight during hard strokes and moves and balances better than bigger boards trying to catch waves.The front of the blade features a curved face designed to move the water to the backside to create the drive and lift of the powerface and to allow easy skimming and turning of the blade across the water. C4 sup paddles also use a tapered oval shaft with appropriate stiffness and flex and an ergonomic palm grip. 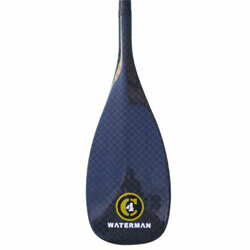 Weighing only 28oz, the paddle is good for paddlers 5'6 to 6'3 and can be expanded to 82". Minimum 73" Max length 82"
Length: Up to 82 inches. The C4 Stand Up Paddle was designed for the sport of SUP but with canoe paddlers and professional surfers in mind as well. The sport of SUP is evolving everyday, and C4 thinks it is important to help it grow, expand, and continue with innovating ways to make stand-up paddling more exciting and interesting.